Three day conference of the 9th Bharatiya Chhatra Sansad was organized at Pune by the MIT World Peace University. It came to an on Sunday, 20th January, 2019. The session held on last day was about ‘Casteism and Corruption’ on which many important personalities spoke and shared their thoughts on the issue. 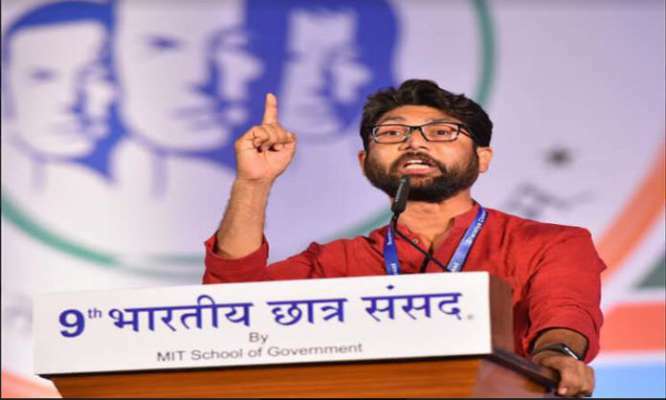 Vadgam, Gujarat MLA and youth leader Jignesh Mevani speaking on the issue said that people often fail to recognize the existence of casteism in the Indian society. He added that the two huge challenges our country is facing currently are that of caste system annihilation and removal of corruption. Mevani went on to make bold statement and said that Casteism was a blot on democracy. He also added “People do not want to admit and acknowledge issues of casteism. But it’s a reality that every day, Dalit women are raped and individuals are murdered due to their caste in various parts of India. Despite this, whenever the question of casteism is raised, Dalits have to face counter questions about ‘Why reservations should be continued?’”. Mevani added that even today there were more than 80 crore people who he said, were surviving on Rs.20 per day. He holds casteism and corruption responsible for such critical lifestyle. He claims that the working class people are the ones that are most affected by corruption. Speaking in favor of farmers, he included “Farmers do not get loan waivers, but corporates do. I look at this as a big scam”. Bharatiya Chhatra Sansad event gets support from the State Ministry of Higher and Technical Education and Ministry of Sports and Youth Welfare and the Union Ministry of Youth Affairs and Sports. The Supreme Court senior lawyer, Prashant Bhushan speaking on the ‘Disquiet in Judiciary’ at the session said that even though there was immense need for judicial reforms in today’s lifestyle, there was no interest shown by the judiciary or the government to implement the same. Bhushan added, “The government doesn’t want reforms in judiciary because they want a collapsed, non-functional judiciary, as its one institution which, if works fine, can hold the Executive to account”. He also Revealed about the ‘disquiet and angry environment’ among the lawyers and judges of the Supreme Court. This was due to the way Ranjan Gogoi, Chief Justice of India, handled the appointment of judges using collegium system. Bhushan said that about 80% of the Indian citizens who end up facing legal issues find it hard to pay to the lawyers. This, he said, in turn leads to the injustice for the poor people, while the people with enough money get stuck in the swirl wind of the judicial process. Majeed Memon, advocate, speaking on a previous year incident said that, four judges of the Supreme court were forced to come out and hold a press conference against the then Supreme Court Chief Justice. After this incident, he added that, those four judges were called to the CJI chamber and settled the matter. Later on the judges joined their duty but unfortunately they were virtually stripped off their responsibilities. Dr. Abhishek Manu Singhvi, Congress leader said “Pandit Nehru was the successor of Mahatma Gandhi. With all his shortcomings, he was basically a liberal personality. So he developed many institutions including the Judiciary. He knew that the judiciary is the power to correct the legislature or the bureaucracy”. You may also like reading the fastest growing Indian language in U.S irrespective of all distinctions in our own country.